A big milestone birthday is always a reason to celebrate! And a chance to play with new InColors that just arrived is also a reason to celebrate. Combine the 2 together, and fun, fun, fun! This card features the new color Berry Burst. It’s a fun, bold and vibrant shade that’s not really pink but not purple either. It’s a fun trendy color and it plays so well with Rich Razzleberry here for the balloons. 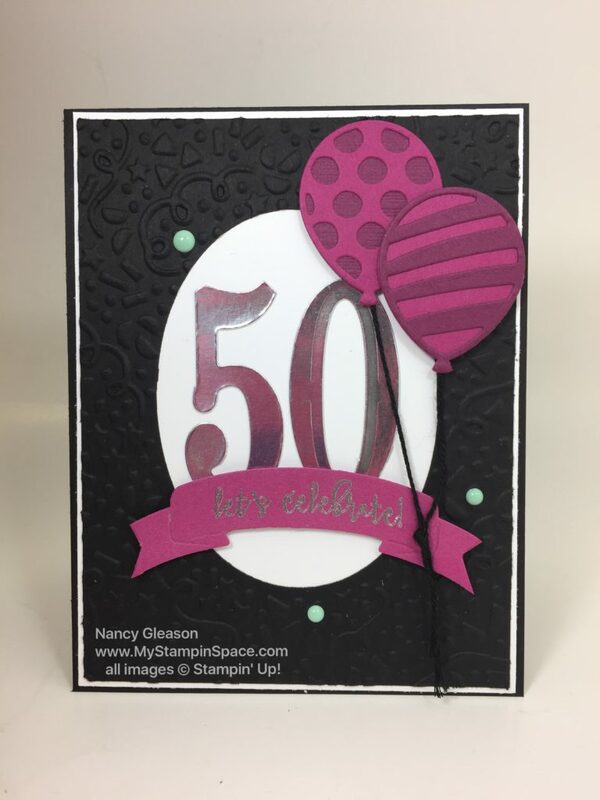 I used these colors as an accent against black and silver (after all it is a 50 birthday!). You’ll notice that I’m using a number of retiring products along with the new In Color. This time of year, I like to combine the old and the new. After the new catalog makes its debut June 1st, I’ll stop showing the retiring product. I like to only show you what you can buy so if you want to recreate my projects you can! The Number of Years stamp set and Large Number Framelits are carrying over (I die cut the number 50 from Silver Foil sheets). The Confetti TIEF and the Balloon Adventures stamp set and Balloon PopUp Thinlits dies are being retired. If you want either of these items; you need to shop my store NOW! They are only available while supplies last. The recipient of this card was Sue, my husband’s admin assistant at work. Her husband threw her a surprise party, and boy, was she surprised! She was totally caught off guard. After she regained her composure, she had a really good time. And so did we! Well, I have more InColors to show you, and more playing around with Daisy Delight and Color Theory. Come back again soon. Click here to see the RETIRING LIST. Don’t forget, you can Pre-Order new products and 3 of the new IN-COLORS with the Eastern Palace Suite. Click here to see the Eastern Palace Pre-Order options. 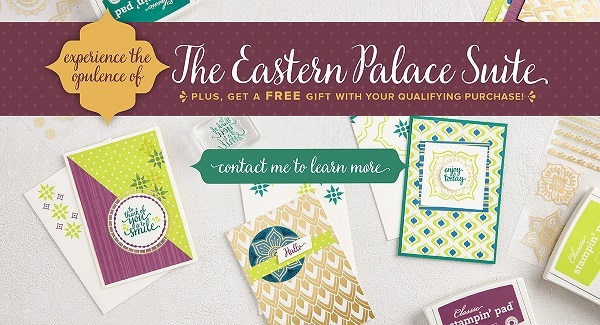 By the way, the Eastern Palace Premier Bundle is the most popular option. Trust me, you are going to want the Eastern Medallion thinlit dies, and the Very Vanilla extra thick card stock comes FREE! Please use HOST CODE CM4QQEWG when placing an order thru my online store for the month of May! Thanks!